What order should the Babylon 5 movies and series be watched in? Can someone tell me what order should the Babylon 5 movies be watched, so as to get the best out of them as a whole while watching the series? I know that release date isn't the best way to do this as they sometimes have to release movies earlier than they'd like to fit in with channel scheduling etc. Basically, 5 episodes of Crusade were produced with minimal meddling. Then filming went on hiatus while the budget was increased and better sets/etc were made - and TNT's meddling went crazy. For example, episodes numbered 1x09 - 1x13 use the original, low-budget uniforms. After the budget was increased, TNT mandated that the high-budget new uniforms be aired first - so they became episodes 1x01 - 1x08. Appearances and Other Deceits had an in-universe designer create the old uniforms as a new design, then one of the unfilmed episodes would have a laundry accident that "returned" them to the new, high-budget uniforms seen in the others. Since that episode was never filmed, we can imagine it happens between Each Night I Dream of Home and The Path of Sorrows, when the chronological ordering switches the uniforms back. The nanotech shield. In airdate order, it was used before Dr. Chambers invents it. In this order, it makes sense. The Apocalypse Box's warning about Galen (in The Memory of War) foreshadows a small distrust between Gideon and Galen that grows throughout the episodes (when in this order), all the way through The Well of Forever. Word of God is that it would have gotten far worse through the remainder of the season. Gideon and Lochley's familiarity with each other. Watch all of Seasons 1, 2 and 3. Watch "In The Beginning" immediately after Season 4 Episode 9 and before Episode 10. This is the best time to watch the movie as you don't get spoilers and it ties in really well with episode 9 in Season 4. Watch Season 5 right up to the episode BEFORE "Objects In Motion"
Watch "Legend Of the Rangers" A lot of people slag this movie, but for G'Kar alone it is worth watching and infinitely better than Star Trek V.
Watch "A Call To Arms" which sets up the spin off show Crusade. Watch the 13 episode series Crusade next. Watch "The Lost Tales" the 2007 I think it was, direct to DVD movie. Watch the Season 5 episode "Objects in Motion". Watch the movie "River of Souls" as this takes place in the year 2263 between "Objects in Motion" and "Objects at Rest" in Season 5 and makes the most sense to watch here. Watch "Objects at Rest" and the grande finale "Sleeping In Light" Watching these 2 episodes back to back has the best emotional impact. Mo matter what "Sleeping In Light" should be watched absolutely LAST. In "Thirdspace", Zack is seen fully wearing and sporting an alternative B5 uniform just like Sheridan and the rest. This, however, is not a formally accepted fact until S4 E09 (the beginning scene). I would thus respectfully suggest that for the sake of consistency that instead of watching "Thirdspace" after S4 E08 to instead watch it after S4 E09. Personally I think you should follow the release order as much as possible, with only a few modifications. Following the release order means you will get the same experience as people watching the show at the time of release. When creating a new episode/film, the creators largely catered towards audiences who had already watched everything released up to that point, and so you should be on fairly safe ground. The film "Thirdspace". It was the first produced movie, although the second to be released. Though it was released during season 5, it's set during season 4 and doesn't contain any spoilers for later-released episodes. It's kind of weird to watch it and go back to that time it was set after so much has happened in between. The series finale episode, "Sleeping In Light". This was intended as an overall finale to the franchise as a whole (the fact that they moved this episode from the end of season 4 to the end of season 5 when a fifth season was ordered attests to this) and therefore should be watched last. It's also set in the year 2281, which is later than any other episode or film (except for segments of the season 4 finale). It's intended to provide finality. 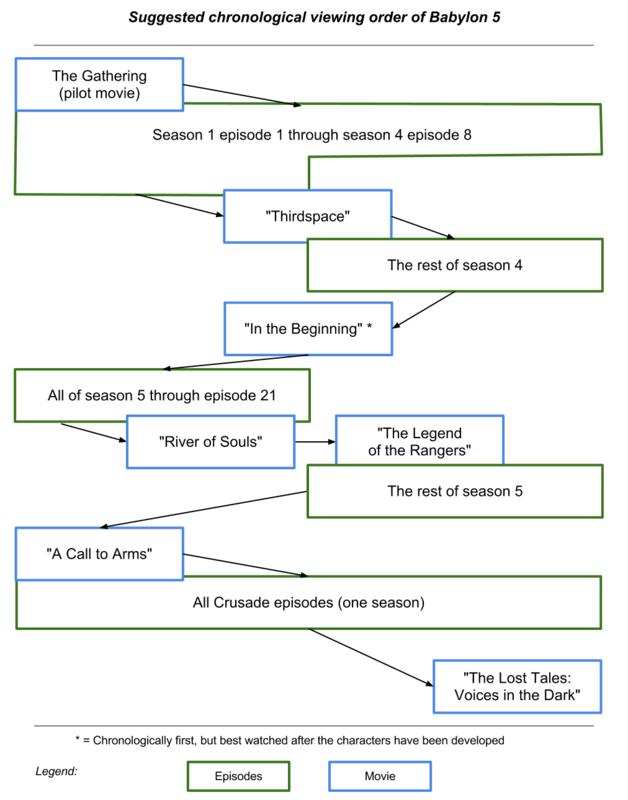 The episodes in the series "Crusade". Here the network messed with the episode order and so to watch it in release order would not be in keeping with the creators' wishes. Watch the pilot film "The Gathering"
Watch the film "In The Beginning"
Watch the film "River Of Souls"
Watch the film "A Call To Arms"
Watch the film "The Legend Of The Rangers: To Live And Die In Starlight"
Watch the film "The Lost Tales: Voices In The Dark"
I understand why other posters have shuffled around "Objects In Motion" and "Objects At Rest" towards the end also as these are "goodbye" episodes. However, they also naturally follow from the earlier episodes in season 5 and wrap up the storyline in 2262 (the year when the majority of season 5 is set) which is before all of the later-released films. The same cannot be said for "Sleeping In Light" which is set much later. So I think "Objects In Motion" and "Objects At Rest" should really be watched immediately after watching the main part of season 5. As Ruben said, Zack doesn't get his alternative B5 uniform till 'S4E9 - Atonement' so Thirdspace should slot in after that. Also, If you're trying to be as chronologically accurate as possible (Though I do agree that 'In the Beginning' should be saved till late in S4 to avoid spoilers) you should save 'S5E22 - Sleeping in Light' till after all of the films and episodes as it takes place much later chronologically. I'm actually doing a re-watch of B5 right now and I realised that theoretically Thirdspace has to slot in later than I previously thought. Most people say between E8 & E9 but as stated above, because of Zack's uniform it can't be before E9. However, after watching through a bit more I realised that Dr Franklin is away from B5 from E9 through E12 and only gets back on station in E13. So though it's later on in the season, assuming Zack's uniform wasn't just a continuity error, Thirdspace should slot in somewhere after E13 - 'Conflicts of Interest' but before the campaign to remove Clarke. I'm watching based on the printed list and not the graphic (the graphic is wrong on several key points). A call To Arms is happening 6 years after the Shadow War, so it would be 2267. It should be one of the last movies watched. The Legend of the Rangers talks about the Anniversary of the Alliance. There is also another problem in that the ship they're on lost it's crew 20 years prior, and there were Human Rangers on board. This totally messes with the Timeline, and G'kar should be dead by this time. Horrible continuity besides being a very cheesy show. I had remembered it being kind of good until watching it again last night and lost it when watching the weapons officer doing the 30 second scream while shadow boxing in VR. It's bad. For the sake of continuity it should be considered "alternate universe" since none of the rangers act ranger-like. My take right now would be watching season 5 until Objects at rest. Watch River of Souls, A Call To Arms, Crusade, Lost Tales, and then the final episode. After all that, then Legend of the Rangers, despite how bad it is. You can do no harm to yourself starting with "In The Beginning." Aside from the obviously harmless title, the movie was made to introduce new viewers to the show when it was picked up by TNT at the beginning of the fifth season. TNT showed seasons 1-4 in progression once a day for five days a week, with a new fifth season episode at a different time slot once a week. There are thousands of people who watched the show, enjoyed it, and became hooked by it while watching it in this nonlinear fashion, including yours truly. Rather than be spoiled by something, you will have an even greater insight into the genius of Babylon 5 storytelling. It's the belief that one viewing order is better than another that may spoil the show! Also don't forget about the novels, several of which are considered canon, especially The Shadow Within and To Dream in the City of Sorrows, which are seamlessly interwoven with the show. Please feel free to pick them up and put them down as you feel to achieve their maximum effect! Not the answer you're looking for? Browse other questions tagged suggested-order babylon-5 or ask your own question. When should Sleeping in Light be viewed? In what order should I watch the original Planet of the Apes film series? Does the DVD commentary of the Babylon 5 movie “Thirdspace” have spoilers? What is the viewing order of the re-imagined Battlestar Galactica? In what order should I watch the various Stargate TV Series? What is the recommended viewing order for young first-timers to watch Star Trek TV episodes and movies? Suggested order to watch entire Dr. Who?